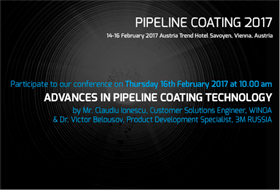 The Pipeline Coating Conference was held in Vienna, from 15th to 16th February 2017. This conference is one of the two major international events concerning the entire supply chain of the pipeline industry. During these two days, industries of Global Energy, Services Company, Coatings Manufacturers, Pipe Coaters, Blasting Machines Manufacturers and Consulting & Engineering markets were present. The W Abrasives French team has chosen this famous conference to present the results of their recent collaboration study between 3M, Gazprom Vniigaz and ChTPZ (one of the biggest Russians pipe coaters), and to present their contribution to the dust issue in surface preparation, thanks to many technologies. The study provides answers to one of the most worldwide debated topics related to the surface preparation process: the influence of the residual dust after blasting process on the lifetime of the protective coatings. Indeed, the coatings lifetime is determined at 75% by the surface preparation and the application procedure and only 25 % is related to the intrinsic characteristics of the coating. As has been highlighted during this conference, the surface preparation process is a critical step before the application of the protective coating system. After abrasive blast cleaning, several key aspects should be checked before the coating application such as surface roughness profile, surface cleanliness & surface dust contamination. All these surface preparation parameters have a major impact on the performance of the applied coating system. In order to improve and facilitate their assessment, W Abrasives developed technologies. WA Clean has been designed to evaluate the cleanliness level or the oxide level (Sa level according to ISO 8501-1) removed from the metallic surface. Equally, the WA 3D Technology has been created in order to improve the surface topography assessment. At this moment one of the most debated topics related to the surface preparation process is the evaluation of the residual dust resulted on the metallic surface after blast cleaning. The ISO 8502-3 standard that regulates this aspect is quite ambiguous. That’s why WINOA decided to develop a new technology adapted to the ISO 8502 – 3, for an objective and more accurate evaluation of the residual dust on the blasted surface. This technology is named WA Dust. W Abrasives has also developed SURFIUM, a premium abrasive blasting media developed to deal with increasingly binding surface preparation specifications. SURFIUM also achieves a reduction by more than 15 % of the residual dust particles generated during the abrasive blasting process. 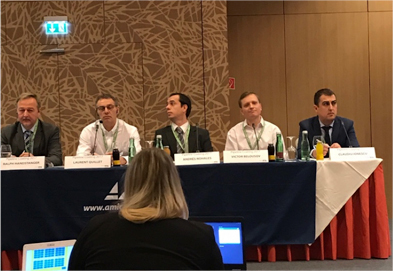 Finally, the Pipeline Coating Conference received considerable attention by its participants, and allowed W Abrasives to strengthen its expertise in the field of the surface preparation. Many industries have directly expressed their interest for this study and for W Abrasives technologies!